Property Management's mission is to pursue customer satisfaction by providing quality infrastructure maintenance, repair and renovation for client departments in an effort to keep properties safe, energy efficient, secure and operational. Implemented a preventative maintenance program to minimize failures and improve long-term effectiveness. Successfully support client departments in their efforts to enhance business operations via work space adjustments, renovations and additions. Identified, designed and implemented cost-saving processes and energy-saving systems to increase efficiency and to save tax dollars. Developed and manage maintenance service contracts to ensure scope adherence and sound fiscal oversight. Effectively maintain and operate aging infrastructure that supports the City’s Police Department, Fire Department, Health Department, Library Department, and a select number of Public Works Department Facilities, eight million square feet of City facilities. 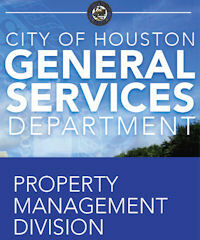 Houston Transtar is now an addition to the Property Management Portfolio. GSD’s Environmental Management section provides environmental consultation and remediation on behalf of other city departments; additionally this section manages environmental site assessments, soil/groundwater monitoring/analytical testing, material testing for construction projects, asbestos abatement, fuel spill cleanup, soil remediation, underground fuel storage tank removal/replacement and indoor air quality assessments and remediation.